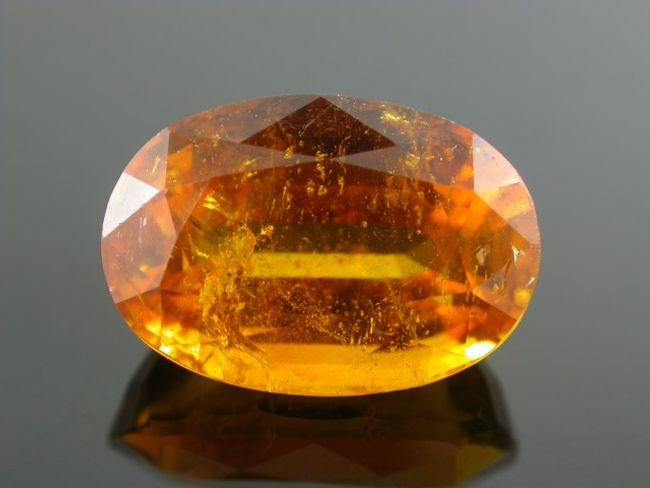 Most commonly found only as small grains, rare larger Clinohumite crystals are sought by collectors; some are occasionally fashioned into bright yellow-orange gemstones. Though the mineral is known for a long time, gemmy crystals have been available in the international market only for the past two decades or so. Gem quality Clinohumite is known to occur in two important localities- the Pamir Mountains (at Kukh-i-lal, Sumdzin and Changin) in Tajikistan in association with spinel and the Taymyr region (Basin of Kotui River) in Siberia (O'Donoghue, 2006, p.400; Henn et al., 2001; Laurs and Quinn, 2004). Another find of Clinohumite has been reported in association with Spinel in Mahenge, Tanzania (Hyrsl, 2001). The authors encountered a large brownish orange gem clinohumite submitted for identification at the Gem Testing Laboratory, Jaipur. The sample (figure 1) was an oval mixed cut measuring 15.13 x 10.41 x 7.78 mm and weighing 9.45 carats. It was transparent and had a bright brownish orange colour showing a strong resemblance to hessonite and spessartine garnets. The stone was slightly included with eye visible inclusions (again figure 1) and was reported to be from Tajikistan. Using traditional gemmological equipment, the stone's properties were determined and are summarized in table 1. Refractive index and birefringence observed were consistent with the values mentioned in literature (e.g. O'Donoghue, 2006). The specimen exhibited a strong pleochroism with yellow, orange and brownish yellow being the three hues and under the short wave ultra violet lamp it displayed strong orange- yellow fluorescence with a surface related greenish yellow chalkiness (figure 2) while no reaction to long wave ultra violet radiations. The surface related chalkiness under SWUV reminded us of fluorescence commonly associated with brown glass coloured by uranium. Figure 2: Strong yellow-orange fluorescence of the clinohumites under SWUV radiation; also note the surface related greenish-yellow chalkiness. Photo by G. Choudhary. 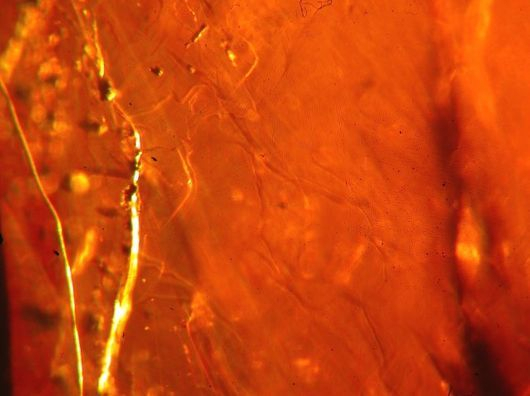 Inclusions and other features were observed in the stone under immersion using both vertical and horizontal type microscopes. The specimen exhibited dominant zones in one direction throughout most of the stone, but there was an angular pattern at one of the narrow end. The overall complex pattern of the growth zoning is probably an indication of the shape of the original crystal. Colour zoning was coincident with the growth zoning only in patches (figure 3). Swirl-like structures were present almost throughout the stone and these may indicate the outlines of the intergrown individual crystals (figure 4). Swirl features are commonly seen in glasses and may occur in some natural gemstones, such as Mogok ruby. To our knowledge, such inclusions have not been reported in Clinohumite. The specimen exhibited flat, parallel and highly reflective planes (figure 5) at an inclination to the dominant growth zones. These may represent incipient cleavage although clinohumite cleavage is reported as poor. 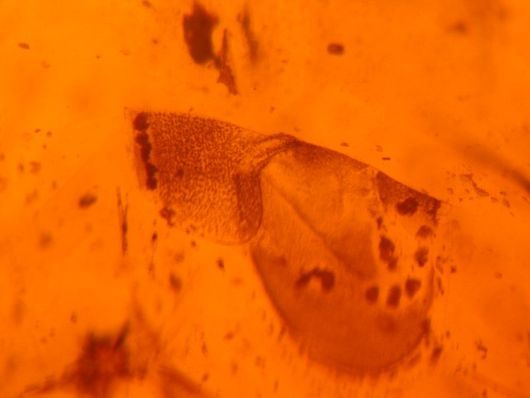 Feathers: The stone contained fluid inclusions in various structures, the most obvious of which were the 'feathers' or 'fingerprints' (figure 6). 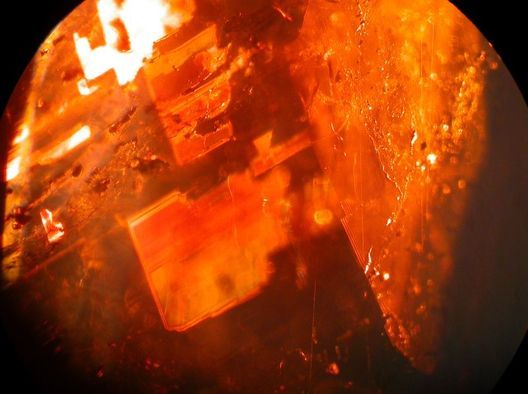 These had the appearance of fine hair and showed high reflection strongly resembling the inclusions common in tourmaline, which have been described as 'trichites'. 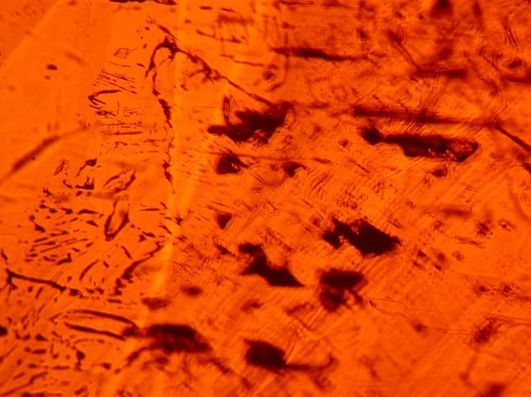 At higher magnification phase inclusions within the “trichites” were also visible. Oriented Phase Inclusions: Many multiphase (mainly two-phase but some also with black crystals) inclusions were observed in certain parts of the stone. These were contained of long, tubes with slightly corroded appearance which were oriented in a single direction. The nature of the inclusions was complex (figure 7) and some reminded us of those seen in kunzite. An infrared spectrum was obtained using a Fourier Transform Infrared Spectroscopy (FTIR) Avatar Nicolet 360 ESP model. The range recorded was 400cm-1 to 6000 cm-1 (figure 8) and the spectrum showed complete absorption between 400 and 2000 cm -1 with numerous peaks between 2400 and 4500 cm-1. 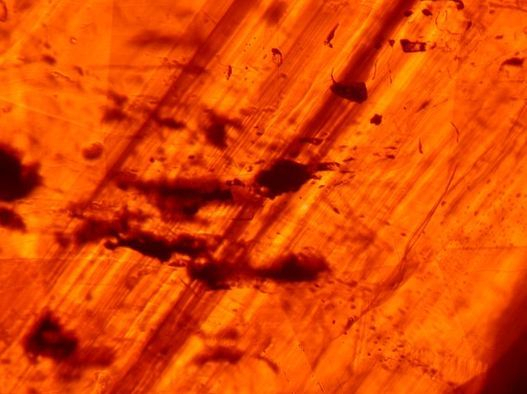 The authors were unable to obtain a standard infrared spectrum of clinohumite for comparison. The 9.45 ct specimen described is a rare example of large gem-quality clinohumite. The bright brownish orange colour is very similar to hessonite and spessartine garnets. 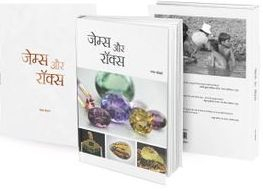 More and more stones are making their way to Jaipur gem trade through the near neighboring countries such as Pakistan and Afghanistan, a fact reflected in the increase in the stones received for identification at the Gem Testing Laboratory, Jaipur. This specimen was submitted to testing by a gem merchant with the information that it has been recovered from the spinel mines in the Pamir Mountains and had been transported through Afghanistan. However the dealer had no idea that it was clinohumite, a gem that was new to him. Arem, J.E., 1987. Color Encyclopedia of Gemstones, second edition. Van Nostrand Reinhold, New York, 113-4.